Now I know the main reason why hario make a cleaner cup than others. Better still, I suggest you to taste the resulting cup first at Fresh to see whether you can distinguish it. If you can't, go with your heart desire..
My current brew is no plunge and longer than the typical 4 minutes for a cleaner and tasty cup with some tendency to overextract a bit... I haven't perfect it but I like it that way, kinda wing it to see how the coffee will come out. That's why I will never be a good barista, ie I'm too lazy on lots of things..
Wow! The method with plunger is so interesting! I can't wait to buy a French press to try this method! 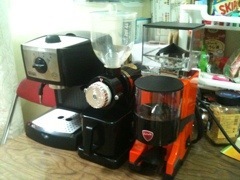 Finally, I bought the Hario double wall in Taipei.